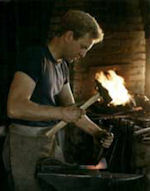 In 1979 I opened my own blacksmith shop in Benmiller, Ontario. I called it Sharp’s Creek Forge after a small creek that ran nearby. I began by doing repair work of all kinds for local clients, and I still do that today. But from the beginning I pursued commissions that offered a chance to combine artistry with function. It took awhile, but eventually clients came looking for that kind of work, and from there our reputation grew. My staff and I now work all over Southwestern Ontario. Over they years, we have produced structures and artifacts for local governments, museums, universities, civic groups, hotels, restaurants and private residences. I was introduced to wrought iron work at an early age, and had a passion for it from the start. My father played an important role here. He shared my interest in the craft of blacksmithing and encouraged my exploration of wrought iron as a medium for creative expression. Despite this early interest, it took awhile for me to accept the fact of that I really did have a vocation as an artisan blacksmith. I received an Honours BA in Sociology and English from Queens University in Kingston Ontario in 1974, and spent a few years working as a social worker. A chance meeting with the blacksmith and historian, Tom Reidel, rekindled my interest in the historic nature of wrought iron work and the importance of strong design. This meeting opened my mind to the call of wrought iron, and the rest, as they say, is history. In addition to my work in the shop, I have been an active member of the blacksmithing community. I attended my first ABANA (Artist-Blacksmith Association of North America) conference in New York in 1978. 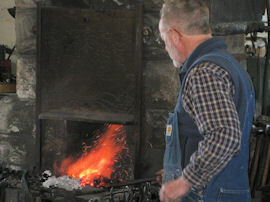 There I met the Ontario blacksmiths Lloyd Johnston and David Norrie. With their assistance, we brought together twelve Ontario blacksmiths to form the OABA (Ontario Artist-Blacksmith Association). OABA was formed in the spring of 1983 and we registered as a Chapter of ABANA soon after. I served as vice-president and president of OABA over the next four years and have been an active and eager supporter since the beginning.